Do you have healthy road relationships? Let's find out! 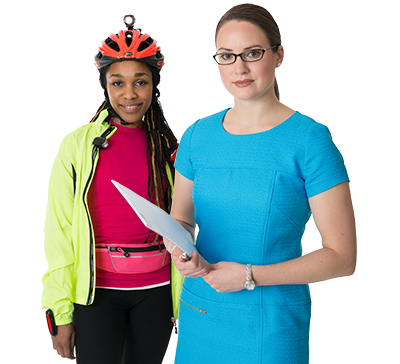 Healthy road relationships between all motorists, bicyclists and pedestrians represent the cornerstone of Dr. Susan Wheeler's philosophy as a Road Relationship Counselor. Whether in a car or on a bicycle, we are all drivers on the roads. Together, we can work to improve our road relationships and drive change in Grand Rapids. Which of the bicyclists would be considered the most visible on the road? Bicyclists must always strive to be as visible as possible. 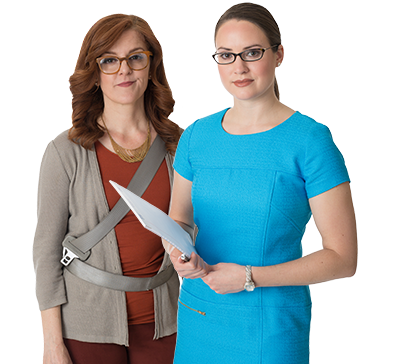 Wearing light-colored or reflective clothing can go a long way toward making you more visible to motorists. Plus, all nighttime rides are required to include a white front light and a red rear reflector or light that is visible from 500 feet, which is about the length of a city block. Bicyclists must always strive to be as clearly visible as possible. 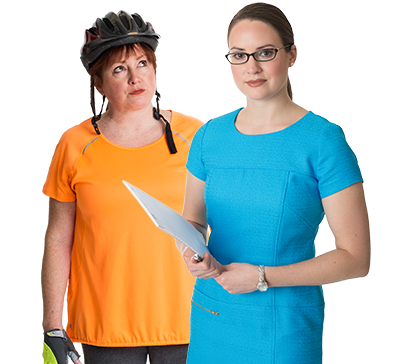 Wearing light-colored or reflective clothing can go a long way make you more visible to motorists. Plus, all nighttime rides are required to include a white front light and a red rear reflector or light that is visible from 500 feet, which is about the length of a city block. What should this motorist do about the approaching bicyclist before exiting the vehicle? Exit the vehicle using the passenger door. 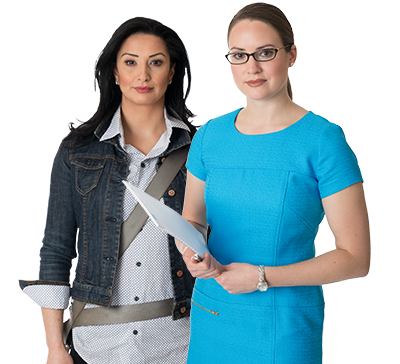 Open the door without hesitation – the motorist has the right of way. Turn and check for oncoming bicycles before opening the door. Find a different parking spot. What should this motorist do about the approaching bicyclist before they exit the vehicle? Opening your car door on a city street can be disastrous to a bicyclist. Motorists must always be on the lookout for bicyclists when getting in and out of their parked cars. 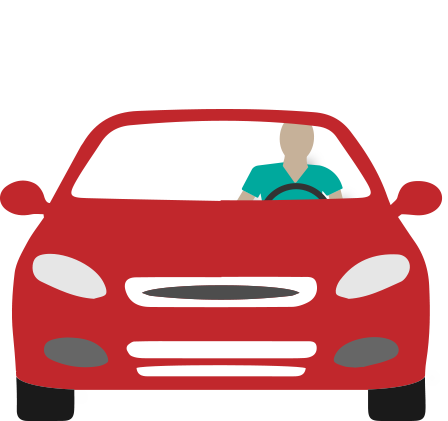 To help you remember to look first, learn the “Dutch Reach.” While seated in your car, use your right hand to open your car door whenever you're parked on the street. That way, you’re automatically facing in the right direction and able to see if anyone is approaching before you open the door. The correct answer is C - Turn and check for oncoming bicycles before opening their door. What does the sharrow (symbol below) indicate? A symbol painted on the pavement to indicate proper lane position for bicyclists. 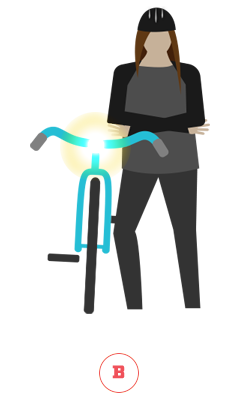 A symbol to help motorists see cyclists better. 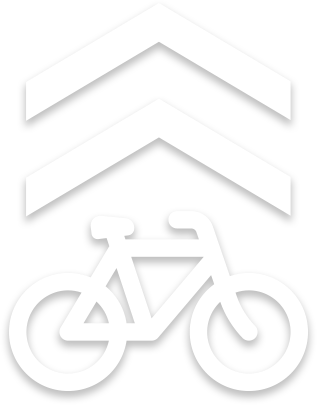 A symbol to remind motorists that they might encounter bicyclists in the lane. 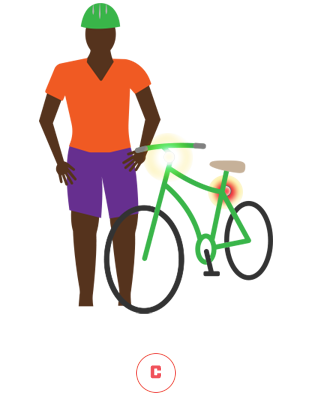 A symbol to help guide bicyclists on designated routes. Sharrows are just one of the markings you may encounter on our city’s streets. A sharrow is a shared lane marker that indicates proper lane positioning for bicyclists when there is no dedicated bike lane present. When you encounter these markings on the road, you should be aware that bicycles may be sharing your traffic lane, and that they are allowed to be there. Be alert, watching for bicyclists, and you should slow down and only pass when you can safely leave 5 feet of space between your vehicle and the bicyclist. The correct answer is E – All of the above. Sharrows are just one of the markings you may encounter on our city’s streets. A sharrow is a shared lane marker that indicates proper lane positioning for bicyclists when there is no dedicated bike lane present. When you encounter these markings on the road, you should be aware that bicycles may be sharing your traffic lane, and that they are allowed to be there. 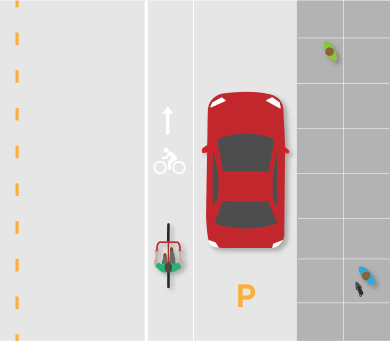 Be alert, watching for bicyclists, and slow down and pass only when you can safely leave 5 feet of space between your vehicle and the bicyclist. 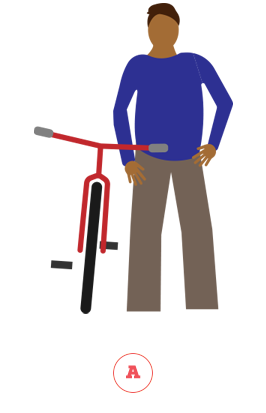 Use the slider bar to move the car to the appropriate distance for passing a bicyclist in Grand Rapids. 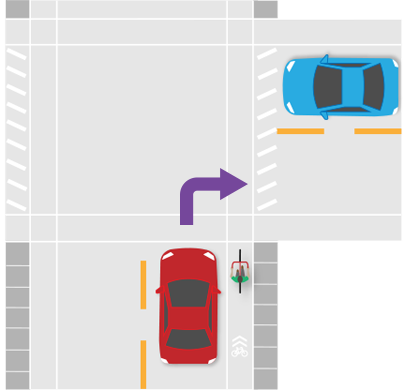 It is required in the City of Grand Rapids for vehicles passing a bicyclist to keep at least a 5-foot separation between the vehicle’s right side, including all mirrors or other projections, and the bicyclist’s left side. Leaving 5 feet of space may require slowing down and waiting for enough room to pass the bicyclist. The correct answer is 5 feet. Which of the bicycles are adults allowed to ride on sidewalks in downtown Grand Rapids? Riding a bicycle on the sidewalk in downtown Grand Rapids is illegal for those age 15 and older. You're much safer riding your bicycle in the street. Here's why: Bicyclists on sidewalks are almost invisible to motorists, and visibility is often affected by trees, shrubs, signs, buildings, people and many other things. Even if they see you, it's difficult to gauge your speed on a the sidewalk. 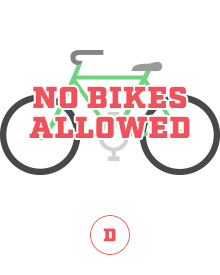 The correct answer is D – No Bicycles Allowed. The motorist in the red car needs to make a right-hand turn at this intersection. How should the driver proceed? Speed up, pass the bicyclist and then make the turn. 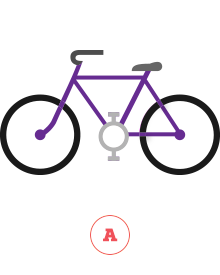 Use the turn signal, merge slowly in front of the bicycle and make the turn. Wait for the bicyclist to clear the bike path and then complete the turn. Do nothing and make the turn. Motorists have the right of way. This is one of the most frequent causes of crashes between bicyclists and motorists. When turning right, motorists should always yield to bicyclists waiting to go through an intersection. As you’re approaching an intersection or a driveway to make a right-hand turn, check for bicyclists coming up from behind your vehicle. As appropriate, yield and allow them to pass before turning. Do not pass bicyclists and turn right in front of them unless it is safe to do so. 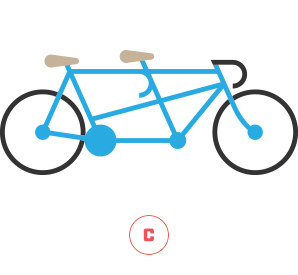 The correct answer is C – Wait for the bicyclist to clear the bike path and then complete the turn. Copyright © 2017 Driving Change. All Rights reserved.